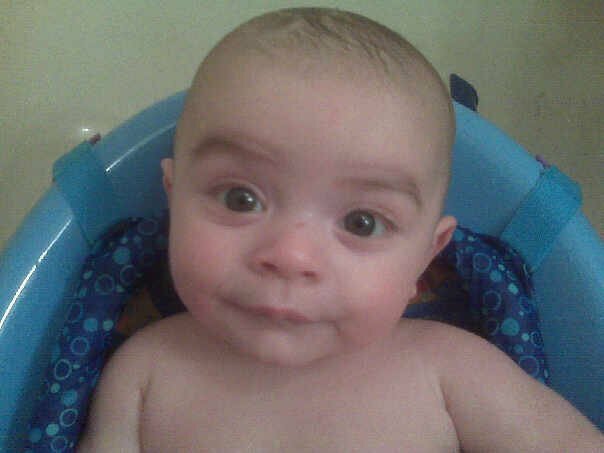 Now that my little boy, Will is 3 months old, & we have had quite a few baths together at this point… I feel like I would like to welcome 2011 with my Top 10 Worst Bath Moments. They will be ranked so that number 1 is the worst bath moment of 2010. 10. As soon as his little body touched the water, he started screaming and he didn’t stop for the entire duration of the bath?! 8. Realizing I forgot to bring any bibs in the bathroom for after the bath, and my little guy is quite the spitter, so he spit up all over his clean towels. 5. Having him poop into the bath water?! 3. Trying to change his diaper while he was sprawled out on my lap, smiling & kicking his legs like a maniac – not to mention I had no wipes?! 2. Having him spit up so badly all over my bathroom floor and all over myself AND himself – that I literally put him back in his bathtub for another bath! I do realize that there will be many more opportunities for far worse bath moments as Will continues to get older & more creative (Please share yours on this blog! ), so allow this list to stand as my newborn version. And for all those of you who brave the world of parenting… Happy bathing to one and all! Yesterday we embarked on the maiden voyage of the Moses basket!!! For those of you wondering, this did not involve me putting Will in the stereotypical baby basket and sending him down the Lehigh River … it did however, involve that I got the beautiful basket out of the corner of Will’s nursery where it had been patiently waiting for its first use. I guess my thoughts began with thinking … well, I might as well try this now before he gets too big and can no longer fit into it. I then considered, that if he screams and cries and the attempt becomes yet another failed positioning item that meant to quiet and soothe him, but instead sends him into a screaming rage … at least we would know the outcome of what would happen if we just give it a try. My plan was to have Will in our office, where John spends countless hours of his days working on his websites – Jesusfreakhideout.com and this new little bundle of joy, LittleJesusFreaks.com. ;o) I guess my goal was to occupy the open counter top-like space on John’s elaborate desk, where I could spread out all my thank you notes and try to make some sense of them. Although I was able to send out almost all of the thank you notes for items that were given to us for Will before he was born … I seem to find myself struggling with getting the thank you notes done for items that were given to us for him after his birth. Perhaps this is because it requires me to now be caring for him endlessly through the many hours in a day when I think I used to have “down time” in my life. I guess it is simply a mommyhood wake-up call that I have been ignoring … but, I think my tank of “down time” has long been on E. Therefore, the need arises in my life, for ways that I can safely put Will down in “something” … whether it be his crib, our couch, his swing, changing table, Newborn napper, or now the possibility of using the Moses basket, hoping that he will be content enough in any one of these positioning devices for a long enough amount of time that would allow for me to get something done. Usually, this might be for me to take a shower, go to the bathroom, or try to have something to eat … but today, it was for the reason of me trying to work on my thank you notes project. I also was hoping to initiate the Moses basket in our office, because the room is somewhat limiting to where I can put Will, leaving the only available place in either the arms of John or myself. So, I momentarily put Will down on the spare bed in his nursery, where I have been sleeping most nights in an attempt to care for his breast feeding needs to the best of my ability. By keeping myself in such close vicinity to him, I am so much more able to hear his subtle cries of hunger, instead of being totally removed from him and relying on a video monitor to wake me out of a sound sleep when he has already completely lost it. 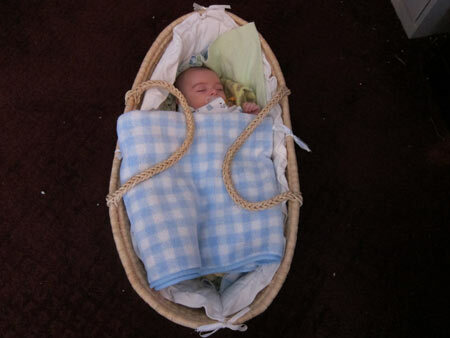 Preparing the Moses basket was not too difficult, because the previous owner who passed it down to me included a beautiful padded bumper ruffle inside the basket complete with a mini mattress pad for comfort. My challenge was to attempt to cover these precious items in order to prevent Will’s lovely regurgitated breast milk from baptizing the pretty white linens. I simply tried to put a few blankets under him and around him so that he would feel cozy in a new environment while at the same time, making sure the basket linens were somewhat protected. I not only was able to get what seemed like a lot accomplished with my thank you notes project, but I realized that this saving grace Moses basket is also portable! I was able to bring Will down into our kitchen with me while I completed some simple chores like emptying our dishwasher, and filling it up again – which mind you, is rather difficult when you are trying to hold a little person at the same time. I also was amazed at the ability for me to simply use the tapping action of my foot to gently rock the basket whenever he would stir. 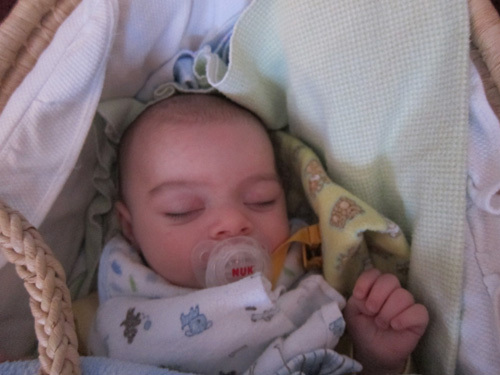 This calming motion was enough to help him get back to sleep. I couldn’t be happier!!! 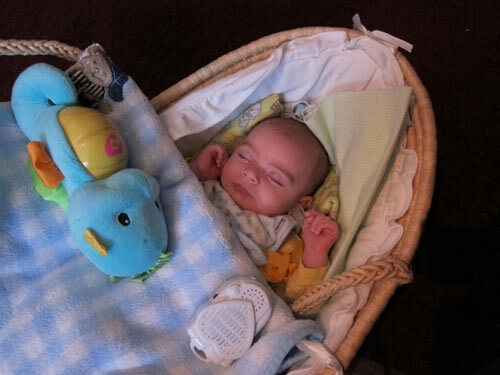 :o) Not only was I getting things done around our house, he was also sound asleep in this miracle basket! Flashback: This really was my last meal. On the evening of Thursday September 30th, while I was still in the triage part of the labor floor, I began discussing our dinner plans with John. I was at the point where I knew that they were going to release me, since my labor was yet again simply false labor. Even though I really was having actual contractions at the time, they were not strong enough in intensity to bring on any kind of cervical dilation. So, it only seemed natural to me to want to discuss what would be on the menu for the night with John as I was preparing to leave the hospital. Thanks to the glorious invention of smart phones with internet access and capabilities for communicating with text messaging, it became a true possibility to arrange the plans for my dinner right from the convenience of my hospital bed. Due to the fact that John and I both have Blackberry cell phones, we routinely converse our thoughts back and forth via the Blackberry messenger service. Basically, this technology is exactly like instant messaging one another in a way that I think is the fastest way to text with one other person in a constantly, flowing conversation. Thank goodness, John did respond to my sincere desire to decide on some kind of take out food that I would be able to pick up on the way home from the hospital. After sharing with him my current craving at the time for Italian food, he agreed to let me satisfy my desire for sauce and cheese, which I had been thinking about almost the entire day! It is true, that for most of my pregnancy, the food that I always seemed to crave was definitely Italian food. John usually agreed to let us eat it sparingly, which was very thoughtful of him. I used to tease John, that since he is 100% Italian by nationality, then the baby that I was carrying only naturally would want me to eat Italian food. Also, I am at least almost 1/8th Italian by my nationality, so that I always thought would have to count for something, too. It was also very possible for me to look at the online menu for the Italian restaurant closest the hospital while I waited for all the paperwork for my discharge from the triage part of the labor floor to get completed. I knew I definitely wanted stuffed shells, but I was on a mission to find something worthy for John to eat. I settled on some rigatoni with chicken in a bolognese sauce, which John agreed sounded good to him. As I was walking out of the hospital to my car, I called ahead and placed the order. It was at this time that I reached the parking deck of the hospital and saw how unbelievably ugly the weather currently was. It was very windy and rainy. The kind of fall weather that reminds you to just be thankful that this isn’t snow yet! This was going to make my simple idea of picking up food more involved than I thought. Once I got to the restaurant, which was The Vineyard on Fiot Street in Bethlehem, I was so excited to patiently wait for my order to be ready. This Italian restaurant in particular had been very good to me throughout my pregnancy. During the early months of my baby’s gestation, I used to suffer almost daily from what was known as “evening sickness.” I have to admit, I went to the Italian restaurant more than once straight from work because of how badly I was craving their food. It seemed rather odd that the sensation of needing to throw up, could be calmed simply by eating food. I would think that eating would be the last brilliant idea on the agenda to calm a nauseous tummy. Thank goodness for the closeness to the hospital of the restaurant, because it was always quite convenient for me to stop by for the essential sauce and cheese dish before going home to my honey. Also, for the record, I would pick up food for John, too – although I would often in more cases than one, have to eat my food as soon as I got out to my car because of how sick I felt. Thank goodness John was very understanding about all of this. He would even encourage me to eat something as soon as I started feeling the sickness coming on, so that I could prevent it from escalating to an even worse state. Once my order was ready, one of the waitresses at the restaurant insisted that she would carry the food out to my car. This was such a nice gesture on her part, and I was so thankful for her kindness. She also was a fellow coworker of mine from the hospital, so she felt somewhat more connected to me I think than if I was a complete stranger who wondered into the restaurant off the street. The meals were all neatly arranged and in a nice, flat box that was perfect for transporting in my car. The waitress placed the box on my front, passenger seat and wished me luck with my soon-to-be motherhood. As I watched her run back into the restaurant away from the wind and rain, she reminded me of an angel who had just done an incredibly worthy deed that would definitely qualify for her to earn her wings! When I finally got home with the wonderful Italian feast, I was so excited to prepare the meals for John and myself, simply meaning that I would serve them on our own plates and with real silverware. There was so much of the rigatoni with chicken in the Bolognese sauce for John, it just barely fit into one of our salad bowls. I simply could not wait, and the idea of eating my savory stuffed shells right out of the aluminum take-home container did not offend me. I did however, put the meatballs that I ordered on the side on one of our plates, so that I could cut them with my fork and not worry about flipping the flimsy, aluminum container across our living room carpeted floor. My senses of both smell and taste were losing their patience when I uncovered the toasted garlic bread that looked like it was right out of a food magazine. Thank goodness John was ready to eat, because I was starving! It even occurred to me, that I really had not eaten anything since about 11 o’clock in the morning when I was given a quick break at work. Therefore, I was totally famished and felt like the food that was set before us in our humble living room that we would consume together while watching a movie was going to be absolutely awesome. It is difficult to say if I actually realized then, that this was going to be my “last meal” before I actually went into what was going to be the real deal for my labor with Will. I definitely had an enormous appetite that evening, consuming all of my delicious stuffed shells and the side of meat balls with some garlic bread. Everything tasted so incredibly wonderful and it seemed like I could just keep on eating forever. Some people claim that it can be difficult eating such large meals when you are at the end of your pregnancy, but thankfully for me, I never seemed to have much of a problem where that was concerned. I was noticing while I came to the end of eating my memorable Italian food, that the intensity of my uterine contractions was definitely worsening. This would not prevent me from enjoying a little bit of dessert, however. One of the most wonderful secrets in our local grocery freezer section throughout my pregnancy has been this lovely little brand of ice-cream desserts called “Skinny Cow.” Now, I am not a calorie-counting kind of person. But, I do like to conserve my sugar intake when it comes to things like ice-cream, because you really don’t want to gamble with the possibility of getting gestational diabetes. This would only possibly complicate the pregnancy and force you to stay on a strict diet that would be difficult for me to follow. The way I look at, if you can settle for an item that still tastes good and is healthier for you, why not? So, with the help of some patience of trying different items focusing on mint chocolate flavoring of course, I treated myself to not one, but two different dessert items following my Italian meal. I even remember walking into our living room and stating to John, “this one is for me, and this one is for Will.” ;o) Hee. The truth is, the ice-cream bars are both fairly small, so I didn’t feel too guilty having a little bit of sweetness with chocolate covered vanilla ice-cream with my first treat … and a chocolate drizzled frozen white mint chocolate bar to top it off. I think I was even determined to still try to enjoy these desserts as much as I could, despite the fact that I was really starting to notice at this point how uncomfortable I was getting with how tight and rigid my tummy was getting with my contractions. Some might suggest that it could have been from what I had just eaten. But deep down, I was actually starting to thing to myself, could this really be it? John did comment later on while we were watching a movie together to commemorate the recent passing of Tony Curtis (Operation Petticoat), that he was surprised I was able to stay awake and not give in to my narcolepsy sleeping disorder. The honest truth is, I rarely am able to actually stay awake until the end of a movie when John and I get the chance to sit down and watch one together. Sometimes, it is embarrassing to admit, that I can’t even make it through a 30-minute show without falling asleep during it. Fortunately, this night was very different from just any ordinary night. 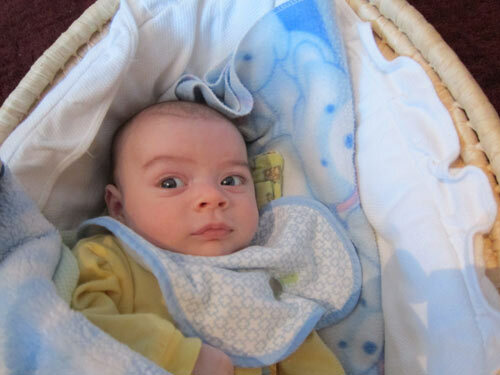 John even suggested that perhaps the pain and increasing discomfort from my contractions was helping me to stay awake. I realized then, that he had just made an excellent point. My one OBGYN doctor commented to me that I would not be able to sleep through real labor. Even times when I was having false labor, the doctor’s recommendation for me was to try to go to sleep. Now, for someone with narcolepsy, this should be a piece of cake. For all the other times that I was in false labor, it did work. Even though I would have several hours in a row of legitimate contractions, upon falling asleep they would diminish to nothing. After a several hour nap, or a long night of sleep, I would awake with the contractions completely gone. So, now I was starting to wonder if I could sleep through these contractions. Flashback: Off to the Hospital, first Triage? It is hard to believe that just over 2 weeks ago, the little person who I now hold in my arms, was still nestled in my tummy safe and sound, coming to the end of a nine-month-long incubation. It was always very challenging for me to consider that when I truly start to go into labor, how would I actually know? Everyone would always give me the generalized quote, “you will just know.” This, surprisingly enough, never really helped me out too much with being able to differentiate false labor from what the real deal would actually feel like. Having been checked with an internal exam just the day before, on Wednesday, September 29th (hoping to see if the dilation of my cervix had progressed any farther), I awoke on the morning of September 30th with some expected cramps and a small amount of bleeding from down below. I had been warned that this is a natural response to being checked once your baby’s gestation is far along, because the cervix is really getting ready to prepare for the delivery of your baby. This week’s appointment was my 39th week of pregnancy milestone. I was almost at my official due date of October 4th, but not quite there yet. Unfortunately, the discouraging result of my internal exam in the office was the fact that my cervix was just 1 cm dilated, which was the same, unchanging measurement from the past 3 weeks of doctor’s appointments. Even after trying all sorts of home remedies like eating fresh pineapple, consuming spicy foods, and spending lots of intimate time with your spouse… it still did not appear like my body was responding to any of these attempts to bring on natural labor (although it was very fun!) But, on the morning of Thursday September 30th, I just felt different. I told myself, that I had to go to work, despite the small amount of bleeding that I noticed when I went to the bathroom right after I got up. I figured that it might just be from my exam, and I didn’t want to take sick time from work if I could physically go to work and perform my duties as an operating room nurse. So, I made it into work, and luckily had a relatively easy assignment of taking care of patients in our holding area who need to be prepared for surgery. Thank goodness, this is mainly a sitting job, and requires a lot of paper work and looking through the paper chart of each patient who comes to our operating room for a procedure. As I sat there performing my duties, I became concerned that I wasn’t really feeling my baby moving around a whole lot in my tummy. It was also at this time, that I definitely noticed that the overall cramping that I had woken up with was now becoming worse, and some uterine contractions were starting to catch my attention as well. I thought this was most likely false labor again, since I had quite my share of it throughout my pregnancy. However, I thought since I am so close to my delivery date, I better call my MD’s office and express my concerns. After my call, I was instructed to try my best to count my baby’s movements over the course of the next hour. Also, it was tentatively arranged that I would go up to the Triage part of the labor floor on my lunch break at 1 pm, to be checked out and reassured that everything is okay with my baby, Will. Fortunately, soon after my phone call to the MD office, I did feel the familiar subtle movements of little Will in my tummy, and I was so relieved! Apparently, it is a known fact that mothers who are coming to the end of their pregnancy can expect to feel less movement from their baby in their tummy, because there is so much less space for the baby to move around in, and overall less amniotic fluid in which they are free to swim around in. Even though I kept reminding myself of these little facts that I was using to try to keep myself calm, I could not ignore the fact that I just basically felt different today. Finally, I was able to go up to the labor floor at 1 pm, and I honestly felt like I was doing the right thing for both my own peace of mind and for the health of Will. The very first thing they did was to hook up my tummy to two different monitors. One was for monitoring the baby’s heart rate. It was such a wonderful feeling getting to hear his rapid little heart rate as soon as the monitor touched my tummy. The second monitor, called a tocometer, was placed on the top of my tummy and was able to measure the frequency and severity of my uterine contractions. So, after an initial evaluation of the monitoring, the doctors determined that I was indeed having legitimate contractions and noticeable cramping that could be seen by these rhythmic printed out waveforms on what looked like a register tape. It also graphed Will’s heart rate in response to the contractions that I was having. The next item on the agenda while I was in triage was to check the current measurement of my cervix with another internal exam by an OBGYN (obstetrics, gynecology) doctor. Hoping to see some improvement from yesterday, I was checked by one of the resident doctors who would be caring for me while I was in triage. Despite the contractions I was having, it was determined that the opening of my cervix was still only 1 cm. Therefore, the contractions were not the “real deal” and they would not be enough to bring on any kind of real labor. Still, the doctors agreed that they would let me walk around the unit for at least an hour, and then they would monitor me again and recheck me again to confirm that my status was unchanged, before letting me go home. It was at this time that I was trying to play catch-up with John, so I could inform him of my current situation. I didn’t really want him to have to come to the hospital, if it was just going to wind up being really nothing at all. Knowing his overall dislike of hospitals in general, I have always tried to keep him as far away from the hospital as possible until it is absolutely necessary that he be there. This triage visit was no different in my mind, especially after the doctors were more or less leaning towards sending me home after my walk around the unit. John was very supportive to me during this experience, and as he often does, I enjoyed his use of humor and sarcasm to help me get through the disappointment of yet again having simply another case of false labor. After my walk was over, and after my official recheck was done showing that my cervix was still only 1 cm… there was one last item on the agenda to do before they would send me home. The doctor explained that because I had been feeling decreased fetal movement, there was an ultrasound-guided test they could perform in order to make sure that the baby had enough amniotic fluid surrounding him that is necessary for him to be able to breathe effectively while in my tummy. I learned that this was called an AFI, standing for amniotic fluid index. It allowed the doctors to use an ultrasound probe on my tummy to measure the 4 different pockets of amniotic fluid that surrounds the baby and determine if there is enough to safely allow the pregnancy to continue. If there would be any sign of a leakage of amniotic fluid, seen by a decrease in the amount of total fluid, than an induction would be required in order to prevent any further complications that occur when there is not enough fluid surrounding the baby. This was also very reassuring for me, because it allowed me to know that the small amount of bleeding that I continued having was just from my cervix. The doctors were able to confirm from the test, that indeed my overall level of amniotic fluid was within normal limits and there was no sign of any rupture of my membranes (meaning that my “water did not break” … yet.) After this final test and getting my instructions for knowing when to come back to the hospital if and when I actually do start to think that I am experiencing the real deal, I was free to go. Yesterday, my husband John and I had the pleasure of attending the wedding of a close friend of ours in Philadelphia. There were very few people who we actually knew at the festivities, but thankfully, we were reunited with two good friends who we had lost touch with over the years. Both individuals were extremely glad to see us there, because they, too, were feeling doubtful that anyone who they knew would be in attendance at the reception. It worked out beautifully that we could all sit together at a reception table, since there was open seating. Since we had not spoken to these two ladies in quite some time, we obviously had some exciting news to share about our little Jesus freak on-the-way. John and I are finally feeling more comfortable about talking with our friends about our newest addition to the DiBiase family, now that I am at least three months into the pregnancy and we have had reassuring ultrasounds showing our little person growing nicely in the little shelter of my tummy. So, it only seemed natural to me to mention our new LittleJesusFreaks.com site as an intro to discussing the subject of our pregnancy. It became a very comfortable way to introduce the idea of us expecting a baby some time in October, because for whatever reason, some times I think it is difficult to come right out and say it. Although the congratulations and excitement of our friends almost always follows, there are some occasions when people don’t respond in such a positive way to what may seem to be ecstatic news. Trying to be sensitive to why some people may respond in this way, is I think the very reason that it can sometimes be awkward to bring up in conversation. However, John was the first one to bring it to my attention yesterday, that he couldn’t help but notice several pregnant young women at the wedding reception who were farther along in their baby’s gestation than me. It was also around this time of the night, when the general dancing for the wedding reception guests opened up with the crowd pleaser of the “Electric Slide.” I didn’t realize then that this would become a comical topic for a blog, but one of my observations during the song really made an impression on me that I felt would be worth sharing. Out of the corner of my eye, I couldn’t help but notice one friend of the bride’s attempting to join the fun on the dance floor to the all-too familiar “Electric Slide.” What really held my attention, however, was the fact that this young woman looked to be rather far along in her pregnancy, probably at the later end of her second trimester. I think this was when I became in awe of the beautiful design that God must have in mind for woman who become with-child. It is a completely natural transition that temporarily borrows the body of a willing and able young woman, to allow her body to be the dwelling place of a new little person until he or she is ready to enter the world. Although the woman’s body does take on rather odd shapes to accommodate this temporary inhabitant, it is all made possible by the amazing design that God has created for His children. So, the biggest impression that this moment made on me, was that the role of being a pregnant mother should not in any way be made to feel like punishment or like some kind of disqualification from a normal life. Although I might have felt a bit hesitant to get out and go crazy on the dance floor last night, I was so pleased that one pregnant mother was determined to have a good time despite her changing body and somewhat awkward appearance compared to everyone else who was out cutting a rug to the “Electric Slide.” It was very encouraging for me to see that even pregnant women can have fun at wedding receptions, and that it would probably be helpful for me to loosen up a little bit in the future the next time I might have the opportunity to have some fun dancing. Unfortunately, as I continue to struggle with morning sickness on literally a daily basis, I was trying sincerely hard to keep my lovely dinner down at the time that the “Electric Slide” began to play. I was very thankful, though, that God provided an outlet for me to observe the joys of another pregnant mother who was obviously well beyond the difficulties of morning sickness, which for me happens at all different times of the day … not just the morning. Hopefully soon, I will be able to feel better as my little Jesus freak continues to grow, and the next time the “Electric Slide” is played in my ear shot, you can better believe I will be attempting my best version of the line dance that I have come to love over the years! Those were the words that I heard speak softly to me, when I held the new life of my close friend’s baby girl in my arms for the first time earlier this evening After struggling to make it through my work day as an Operating Room registered nurse, filled with heartache and pain, my life became grounded again by the little moment that God gave me, reminding me of the amazing blessings that God has in store for those who He desires to bless with little children. To see the astounding love in the eyes of my close friend and her beloved husband, who created this new life together with the breath of God, was enough to allow me to forget the troubles and concerns of my day and become focused again on God’s goodness. This little moment of grace also allowed me to be reminded of the growing new life inside of me, that in less than 7 months, will miraculously be a precious blessing to my husband and me. Although only slightly bigger than an inch at the time, the little person inside of me will one day soon be ready to make his or her entrance into this world, with God’s help.